For new moms, it's far too easy to be overwhelmed with feelings of fear, inadequacy, and guilt - social media and the Internet tells us what our homes should look like, how our kids should behave in public, the healthy dinners we should serve to our kids daily, the Pinterest-worthy craft projects we should tackle during nap time, etc. But we are not called to be perfect mothers - we are called to parent the best that we can with grace, forgiveness, and unconditional love. The moment your new baby comes into your arms, a whole new set of emotions rushes in—pride, joy, wonderment, fear, and, yes, guilt. Because everything you do or don't do as a guardian of this child is all your fault forevermore. That's what it feels like anyway, sometimes, as a parent. Who hasn't brushed off his or her kids ("Not now, son, I'm busy") only to later regret that choice (even if at the moment you were working on finding world peace or writing an article on overcoming said guilt)? It's most often called "mommy guilt" because we moms tend to berate ourselves—and be judged by others—for our child rearing, but fathers experience this guilt as well. It comes with the territory of being a parent. Mom's milk might not be enough to breastfeed the child or mom decides not to breastfeed when everyone else is saying it's best for the baby. You forgot, again, that it's pajama day at school (or, in my case, you sent your kid to school in her pajamas on the wrong day). Your kid is allergic to dogs and you have three of them. You took your kid out to the playground but it's burning hot and you forgot the hat or sunscreen. You took your kid out to the playground but it's freezing and you forgot the hat and gloves. You can't find the overdue library books. You missed a recital or a soccer game because of work or maybe other plans. Your child isn't getting along with many of the other kids at school and you wonder if he or she inherited your poor social skills. You're raising an only child and feel guilty for his or her lack of a sibling (especially for the future when you're an aging parent and the burden of taking care of you is on his or her shoulders alone). You're raising multiple children and can't give each of them the same attention all the time. You can't give everything to your children that your parents gave you. Your kids subsist on a diet of McNuggets and chocolate milk. Some weeknights, so do you. You lose your patience and snap or yell at your kids—the biggest guilt inducer for parents, according to one survey (bigger than working, spanking, or missing a school event). Originally this short list had about twice as many bullets, but you get the point. Pretty much anything that affects your kids is something you could feel guilty about, warranted or not. Some of these are the result of our own decisions or presence of mind, but it's obvious that others are either beyond our control or no big deal in the large scheme of things. (Pajama day will come again.) But many of us hold ourselves to higher standards when it comes to parenting than perhaps any other endeavor. Here are my theories. First, everyone has an opinion on child rearing because we've all seen it in action for much of our lives. We've had a long time to consider what our parents did right or wrong when raising us, and so we have this idea of what we would and should do as parents—what being a "perfect" parent is like. Shuttling kids to and from activities with a smile, never raising your voice, preparing healthy meals your kids gobble up, never forgetting a PTA meeting (and actually going to them), and so on. It's demanding, and it's pretty much impossible to never fall short from the ideal or never feel guilty when we're often torn in so many directions. For many of us, parenthood is also a huge part of our identities, and anything that goes right or wrong can feel like a reflection of our efforts or abilities. Kid got straight A's in school? Good job, Mom and Dad! Didn't make the honor roll? Why didn't you push them harder? Unlike many other pursuits, there are very high stakes when raising a child—a human being you could possibly scar for life (and who might blame you forever for it). Other people don't help either, from your kid reminding you of that time you gave him the most crooked haircut ever to the people in the restaurant or the airplane giving you dirty looks if your kid is crying or glued to the iPad. Don't even get me started on other parents on the playground or in parenting forums. Frankly, you can't win [the battle between parenting perfection and your individual adulthood]. But maybe you can raise children who are better equipped than you are to cope with a culture that promotes unattainable and contradictory ideals while simultaneously depending upon an economic marketplace of information and goods that promise to temporarily assuage media-induced feelings of inadequacy. To do so, you'll need to consider your past performance and iterate accordingly. That's how we model critical thinking and self-reflection for our children. Admit your own fallibility and be willing to adapt and change. 1. Decide if what you've done is something you really should regret. Not volunteering for the school fair even though your kids' friends' parents all do? 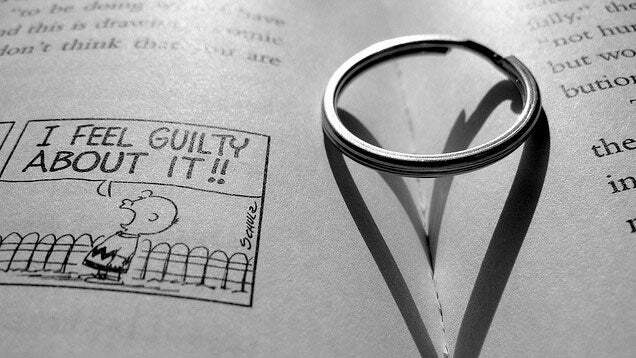 Not worth feeling guilty about. On the other hand, forgetting to take your kid to the fair after promising to do so produces worthy guilt. (You'll remember to put it on your calendar next time.) Other things that shouldn't warrant a guilt trip include those that are essential for your well-being, such as going to the gym and leaving your kid in the daycare or enjoying a night out with your spouse. We're primed to put our kids first, but that also means making sure we have our needs taken care of as well (the airplane emergency oxygen mask rule of putting your mask on first comes to mind). Also, separate the things you can control (your child brushing her teeth every day and avoiding junk food) with those you can't (cavities) to put things into perspective. If self-criticism is a problem for you, ask yourself: If a friend came to you with a similar regret, would you think the guilt is justified? Parenting is not about perfection. Learning to be a more effective parent isn't the same thing as learning to be a skilled glass blower. Glass doesn't have an ability to talk back, challenge, or call you "the meanest parent in the world." We're not parenting inanimate objects and we're human too. The safety guidepost: You, as a parent, are responsible for providing a safe environment in which your child can grow and learn. The first trick to helping you prioritize is to ask yourself this question, "In what way would my child be harmed if I didn't do this task right now?" If the answer is, "not much to not at all," you've just found an item that can easily be dropped down the priority totem pole. Housework is an ideal example. In our survey for this book, 59 percent of participants reported feelings of guilt over not keeping up with the housework. So please, hear this: It is perfectly fine for your house to look as though children live in it—even when guests drop by! You can have toys on the floor, snacks out on the table, and shoes piled up near the door. Put another way: "You do too much as it is. You're not Superman, you know." 4. Pause before you react. Some of the worst guilt-inducing moments happen because of our knee-jerk reactions. (Usually after a long day when we've just about had it UP TO HERE with everything.) Try to make it a habit to pause before responding to children—whether your kid is being "good" or "bad"—and you can become a more mindful, calmer, and less stressed parent. 5. Find practical solutions to the big things that make you feel guilty. Finally, if you feel guilty because of work-life balance, try solutions like asking for flex time or combining business travel with vacation. If you feel like you're not getting in enough quality time, try setting aside an hour or so when you focus completely on your children, playing whatever games they choose. Also, find a sounding board—friends or other parents in the same boat—to help overcome the other pangs of guilt you're having trouble finding solutions for. There aren't any bad choices here. The only bad choice is for you to be a miserable parent, to not be present, to not be investing time as much as you can in your kid, or to not meet those basic needs—the biological-level needs. How do you combat Mom-Guilt? If you have a strategy you've found helpful, please share it in the comments section below.